The operation, which is located in Marbach an der Donau, is one of the world’s best-equipped companies in off-set printing. The technology mix enables every procedure to be optimally used on behalf of its customers. However, the company’s flexibility with respect to non-standard products results in more complex orders, whose success also depends on its strengths in print finishing and processing. Therefore, in an effort to ensure continuous process optimization, Sandler replaced its outdated saddle stitcher with two Primera MC machines from Muller Martini. With a capacity of 14,000 cycles per hour, the company’s productivity jumped considerably. Managing Director Hannes Sandler can track production at his two new Primera MC saddle stitchers at any time using an app on his cellphone. Gone are the times when the older saddle stitchers increasingly threw production off schedule. 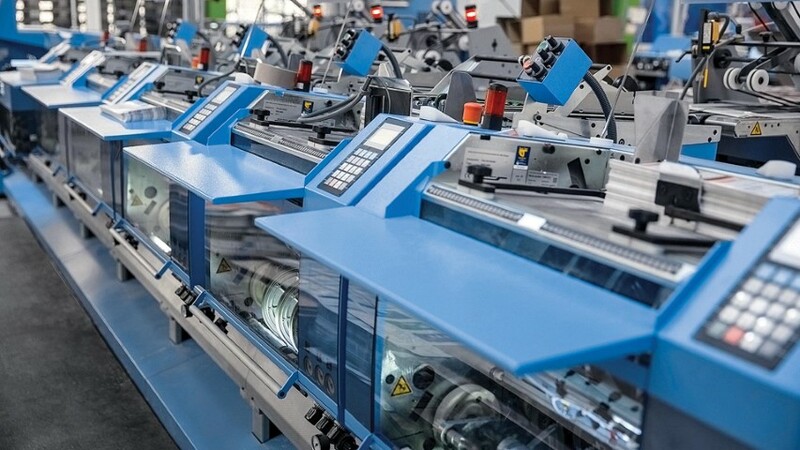 The view that it was impossible to ramp up the capacity of modern printing machines without first improving performance was followed up with action. ”The high uptime and production reliability of the Primera MC make it a must-have machine for companies that currently think on an industrial scale,” notes Managing Director Hannes Sandler. In particular, he highlighted the quick changeover and setup times thanks to Motion Control Technology. The networking of the machine – in line with the Finishing 4.0 approach – makes it possible to follow the status of the Primera MC using a mobile app. The two new saddle stitchers are also configured differently based on the company’s needs. To handle short and medium runs, one of the saddle stitchers is equipped with two cover feeders and eight vertical pile feeders. The other one lends itself to the smooth processing of runs of well over a million copies thanks to its cover feeder and five flat pile feeders with stream feeders.